I have a blog in Portuguese which I now decided to translate because of my contacts abroad. As the first entries follow a timeline, I suggest that you start from the beginning, according to the list on the side bar. [The link to my original blog is http://umaateiadebomhumor.blogspot.com/] I will not translate all my entries since there are some I don't think are that relevant. PRINCETON, N.J. — The simple fact was that he had done something wrong, and at the end of a long and revolutionary career it didn’t matter how often he’d been right, how powerful he once was, or what it would mean for his legacy. Dr. Robert L. Spitzer, considered by some to be the father of modern psychiatry, lay awake at 4 o’clock on a recent morning knowing he had to do the one thing that comes least naturally to him. He pushed himself up and staggered into the dark. His desk seemed impossibly far away; Dr. Spitzer, who turns 80 next week, suffers from Parkinson’s disease and has trouble walking, sitting, even holding his head upright. The word he sometimes uses to describe these limitations — pathetic — is the same one that for decades he wielded like an ax to strike down dumb ideas, empty theorizing and junk studies. Now here he was at his computer, ready to recant a study he had done himself, a poorly conceived 2003 investigation that supported the use of so-called reparative therapy to “cure” homosexuality for people strongly motivated to change. What to say? The issue of gay marriage was rocking national politics yet again. The California State Legislature was debating a bill to ban the therapy outright as being dangerous. A magazine writer who had been through the therapy as a teenager recently visited his house, to explain how miserably disorienting the experience was. Dr. Spitzer’s fingers jerked over the keys, unreliably, as if choking on the words. And then it was done: a short letter to be published this month, in the same journal where the original study appeared. The idea to study reparative therapy at all was pure Spitzer, say those who know him, an effort to stick a finger in the eye of an orthodoxy that he himself had helped establish. In the late 1990s as today, the psychiatric establishment considered the therapy to be a nonstarter. Few therapists thought of homosexuality as a disorder. It was not always so. Up into the 1970s, the field’s diagnostic manual classified homosexuality as an illness, calling it a “sociopathic personality disturbance.” Many therapists offered treatment, including Freudian analysts who dominated the field at the time. Advocates for gay people objected furiously, and in 1970, one year after the landmark Stonewall protests to stop police raids at a New York bar, a team of gay rights protesters heckled a meeting of behavioral therapists in New York to discuss the topic. The meeting broke up, but not before a young Columbia University professor sat down with the protesters to hear their case. He compared homosexuality with other conditions defined as disorders, like depression and alcohol dependence, and saw immediately that the latter caused marked distress or impairment, while homosexuality often did not. He also saw an opportunity to do something about it. Dr. Spitzer was then a junior member of on an American Psychiatric Association committee helping to rewrite the field’s diagnostic manual, and he promptly organized a symposium to discuss the place of homosexuality. That kicked off a series of bitter debates, pitting Dr. Spitzer against a pair of influential senior psychiatrists who would not budge. In the end, the psychiatric association in 1973 sided with Dr. Spitzer, deciding to drop homosexuality from its manual and replace it with his alternative, “sexual orientation disturbance,” to identify people whose sexual orientation, gay or straight, caused them distress. The arcane language notwithstanding, homosexuality was no longer a “disorder.” Dr. Spitzer achieved a civil rights breakthrough in record time. Partly as a result, Dr. Spitzer took charge of the task of updating the diagnostic manual. Together with a colleague, Dr. Janet Williams, now his wife, he set to work. To an extent that is still not widely appreciated, his thinking about this one issue — homosexuality — drove a broader reconsideration of what mental illness is, of where to draw the line between normal and not. The new manual, a 567-page doorstop released in 1980, became an unlikely best seller, here and abroad. It instantly set the standard for future psychiatry manuals, and elevated its principal architect, then nearing 50, to the pinnacle of his field. He was the keeper of the book, part headmaster, part ambassador, and part ornery cleric, growling over the phone at scientists, journalists, or policy makers he thought were out of order. He took to the role as if born to it, colleagues say, helping to bring order to a historically chaotic corner of science. But power was its own kind of confinement. Dr. Spitzer could still disturb the peace, all right, but no longer from the flanks, as a rebel. Now he was the establishment. And in the late 1990s, friends say, he remained restless as ever, eager to challenge common assumptions. That’s when he ran into another group of protesters, at the psychiatric association’s annual meeting in 1999: self-described ex-gays. Like the homosexual protesters in 1973, they too were outraged that psychiatry was denying their experience — and any therapy that might help. Reparative therapy, sometimes called “sexual reorientation” or “conversion” therapy, is rooted in Freud’s idea that people are born bisexual and can move along a continuum from one end to the other. Some therapists never let go of the theory, and one of Dr. Spitzer’s main rivals in the 1973 debate, Dr. Charles W. Socarides, founded an organization called the National Association for Research and Therapy of Homosexuality, or Narth, in Southern California, to promote it. By 1998, Narth had formed alliances with socially conservative advocacy groups and together they began an aggressive campaign, taking out full-page ads in major newspaper trumpeting success stories. He recruited 200 men and women, from the centers that were performing the therapy, including Exodus International, based in Florida, and Narth. He interviewed each in depth over the phone, asking about their sexual urges, feelings and behaviors before and after having the therapy, rating the answers on a scale. He then compared the scores on this questionnaire, before and after therapy. “The majority of participants gave reports of change from a predominantly or exclusively homosexual orientation before therapy to a predominantly or exclusively heterosexual orientation in the past year,” his paper concluded. The study — presented at a psychiatry meeting in 2001, before publication — immediately created a sensation, and ex-gay groups seized on it as solid evidence for their case. This was Dr. Spitzer, after all, the man who single-handedly removed homosexuality from the manual of mental disorders. No one could accuse him of bias. But gay leaders accused him of betrayal, and they had their reasons. The study had serious problems. It was based on what people remembered feeling years before — an often fuzzy record. It included some ex-gay advocates, who were politically active. And it did not test any particular therapy; only half of the participants engaged with a therapist at all, while the others worked with pastoral counselors, or in independent Bible study. Several colleagues tried to stop the study in its tracks, and urged him not to publish it, Dr. Spitzer said. Yet, heavily invested after all the work, he turned to a friend and former collaborator, Dr. Kenneth J. Zucker, psychologist in chief at the Center for Addiction and Mental Health in Toronto and editor of the Archives of Sexual Behavior, another influential journal. “I knew Bob and the quality of his work, and I agreed to publish it,” Dr. Zucker said in an interview last week. The paper did not go through the usual peer-review process, in which unnamed experts critique a manuscript before publication. “But I told him I would do it only if I also published commentaries” of response from other scientists to accompany the study, Dr. Zucker said. Those commentaries, with a few exceptions, were merciless. One cited the Nuremberg Code of ethics to denounce the study as not only flawed but morally wrong. “We fear the repercussions of this study, including an increase in suffering, prejudice, and discrimination,” concluded a group of 15 researchers at the New York State Psychiatric Institute, where Dr. Spitzer was affiliated. Dr. Spitzer in no way implied in the study that being gay was a choice, or that it was possible for anyone who wanted to change to do so in therapy. But that didn’t stop socially conservative groups from citing the paper in support of just those points, according to Wayne Besen, executive director of Truth Wins Out, a nonprofit group that fights antigay bias. On one occasion, a politician in Finland held up the study in Parliament to argue against civil unions, according to Dr. Drescher. “It needs to be said that when this study was misused for political purposes to say that gays should be cured — as it was, many times — Bob responded immediately, to correct misperceptions,” said Dr. Drescher, who is gay. But Dr. Spitzer could not control how his study was interpreted by everyone, and he could not erase the biggest scientific flaw of them all, roundly attacked in many of the commentaries: Simply asking people whether they have changed is no evidence at all of real change. People lie, to themselves and others. They continually change their stories, to suit their needs and moods. By almost any measure, in short, the study failed the test of scientific rigor that Dr. Spitzer himself was so instrumental in enforcing for so many years. It took 11 years for him to admit it publicly. At first he clung to the idea that the study was exploratory, an attempt to prompt scientists to think twice about dismissing the therapy outright. Then he took refuge in the position that the study was focused less on the effectiveness of the therapy and more on how people engaging in it described changes in sexual orientation. After retiring in 2003, he remained active on many fronts, but the reparative study remained a staple of the culture wars and a personal regret that wouldn’t leave him be. The Parkinson’s symptoms have worsened in the past year, exhausting him mentally as well as physically, making it still harder to fight back pangs of remorse. And one day in March, Dr. Spitzer entertained a visitor. Gabriel Arana, a journalist at the magazine The American Prospect, interviewed Dr. Spitzer about the reparative therapy study. This was not just any interview; Mr. Arana went through reparative therapy himself as a teenager, and his therapist had recruited the young man for Dr. Spitzer’s study (Mr. Arana did not participate). That did it. The study that seemed at the time a mere footnote to a large life was growing into a chapter. And it needed a proper ending — a strong correction, directly from its author, not a journalist or colleague. A draft of the letter has already leaked online and has been reported. One of six hundred outdoors Mr. Malafia released in Rio de Janeiro City on Sep 2010: "In favor of family and preservation of mankind. God created male and female." This is a short post about Avon Products, Inc. and how their policies regarding LGBT community are not the same depending on the country. In addition, this a call for action for my friends and readers abroad, mainly in the USA, since Avon headquarters are American and their representatives in other countries are subsidiaries. As you probably know, Human Rights Campaign (HRC) makes a list every year called Buyer’s Guide to help people decide from which corporations to buy their products and services. 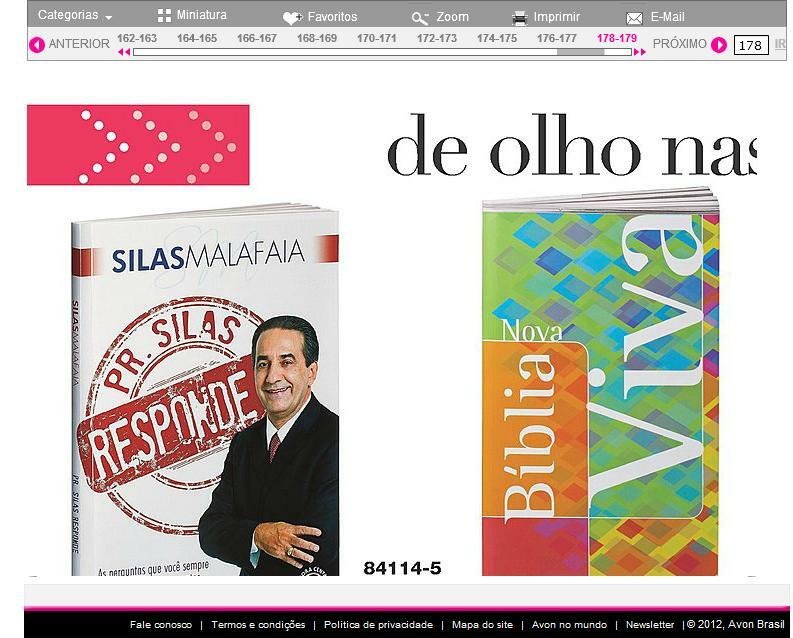 The personal care company Avon Products is very well rated by HRC, but their subsidiary in Brazil has in their product catalogs books written by a notorious anti-gay evangelical leader named Silas Malafaia. He’s like Pat Robertson in the sense of being a pioneer in moving Brazil’s evangelical right into the national political realm. 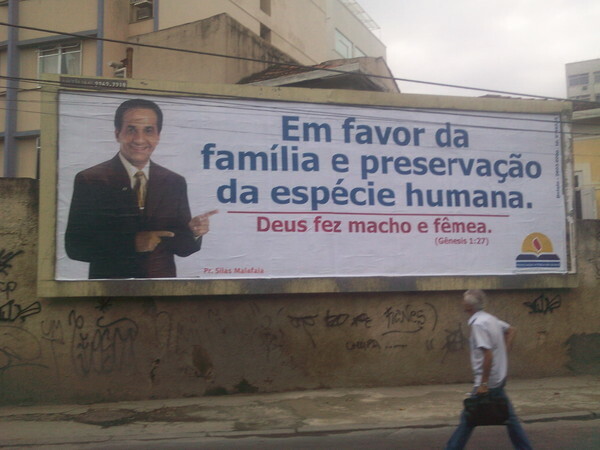 Mr. Silas Malafaia is a television evangelist and he uses his milions of dollars to broadcast paid shows in two Brazilian’s national networks, besides having frequent meetings with congressmen in the capital of the country, Brasília. I highly suggest you to take a better look in all Mr. Malafia said to NYT. Above you can see one of Mr. Malafaia’s books announced in Avon’s catalogs. Acoording to Avon Brazil, in their advisor page, their brochure “Fashion and Home” is the largest seller of books in Brazil. When Avon offers Mr. Malafaia books, the company is helping Mr. Malafaia to continue his persecution against LGBT community in Brazil. Many of us had already contacted the company both in Brazil and USA, but we need your help to speak about this issue louder. This is why I’m asking you to send a message to Avon USA (Contact Us) so they can push Brazil’s subsidiary to review their catalog and remove the books of this anti-gay evangelical leader. Also help us to spread this call for action to your friends that are consumers of Avon products. Besides that, you can sign our petition to Avon Brazil in this link. You just need to provide your full name (Nome completo) and e-mail address. You can also fill your city (Cidade) and CEP (Zip code) if you wish. You can also speak out to Avon USA using their social networks: Facebook and Twitter. I’m really grateful for your help with this issue. Richard Dawkins: "Why I refuse to debate with William Lane Craig"
This is an old issue, but it's always good to make certain points very clear. Don't feel embarrassed if you've never heard of William Lane Craig. He parades himself as a philosopher, but none of the professors of philosophy whom I consulted had heard his name either. Perhaps he is a "theologian". For some years now, Craig has been increasingly importunate in his efforts to cajole, harass or defame me into a debate with him. I have consistently refused, in the spirit, if not the letter, of a famous retort by the then president of the Royal Society: "That would look great on your CV, not so good on mine". Craig's latest stalking foray has taken the form of a string of increasingly hectoring challenges to confront him in Oxford this October. I took pleasure in refusing again, which threw him and his followers into a frenzy of blogging, tweeting and YouTubed accusations of cowardice. To this I would only say I that I turn down hundreds of more worthy invitations every year, I have publicly engaged an archbishop of York, two archbishops of Canterbury, many bishops and the chief rabbi, and I'm looking forward to my imminent, doubtless civilised encounter with the present archbishop of Canterbury. In an epitome of bullying presumption, Craig now proposes to place an empty chair on a stage in Oxford next week to symbolise my absence. The idea of cashing in on another's name by conniving to share a stage with him is hardly new. But what are we to make of this attempt to turn my non-appearance into a self-promotion stunt? In the interests of transparency, I should point out that it isn't only Oxford that won't see me on the night Craig proposes to debate me in absentia: you can also see me not appear in Cambridge, Liverpool, Birmingham, Manchester, Edinburgh, Glasgow and, if time allows, Bristol. "But of the cities of these people, which the LORD thy God doth give thee for an inheritance, thou shalt save alive nothing that breatheth: But thou shalt utterly destroy them"
You might say that such a call to genocide could never have come from a good and loving God. Any decent bishop, priest, vicar or rabbi would agree. But listen to Craig. He begins by arguing that the Canaanites were debauched and sinful and therefore deserved to be slaughtered. He then notices the plight of the Canaanite children. "But why take the lives of innocent children? The terrible totality of the destruction was undoubtedly related to the prohibition of assimilation to pagan nations on Israel's part. In commanding complete destruction of the Canaanites, the Lord says, 'You shall not intermarry with them, giving your daughters to their sons, or taking their daughters for your sons, for they would turn away your sons from following me, to serve other gods' (Deut 7.3-4). […] God knew that if these Canaanite children were allowed to live, they would spell the undoing of Israel. […] Moreover, if we believe, as I do, that God's grace is extended to those who die in infancy or as small children, the death of these children was actually their salvation. We are so wedded to an earthly, naturalistic perspective that we forget that those who die are happy to quit this earth for heaven's incomparable joy. Therefore, God does these children no wrong in taking their lives." "So whom does God wrong in commanding the destruction of the Canaanites? Not the Canaanite adults, for they were corrupt and deserving of judgment. Not the children, for they inherit eternal life. So who is wronged? Ironically, I think the most difficult part of this whole debate is the apparent wrong done to the Israeli [sic] soldiers themselves. Can you imagine what it would be like to have to break into some house and kill a terrified woman and her children? The brutalising effect on these Israeli [sic] soldiers is disturbing." "I have come to appreciate as a result of a closer reading of the biblical text that God's command to Israel was not primarily to exterminate the Canaanites but to drive them out of the land. […] Canaan was being given over to Israel, whom God had now brought out of Egypt. If the Canaanite tribes, seeing the armies of Israel, had simply chosen to flee, no one would have been killed at all. There was no command to pursue and hunt down the Canaanite peoples. It is therefore completely misleading to characterise God's command to Israel as a command to commit genocide. Rather it was first and foremost a command to drive the tribes out of the land and to occupy it. Only those who remained behind were to be utterly exterminated. No one had to die in this whole affair." So, apparently it was the Canaanites' own fault for not running away. Right. I heard this expression several years ago, but I didn't remember exactly in what context. It seemed very appropriate, though, to describe the feeling that comes over us when we face the idea that we are alone before the Universe. When we get to the conclusion that there is no supernatural being to protect us, the first sensation is of helplessness, it's scary. The intensity of that fear will vary according to how much the person was involved in the religious thinking, but it always occurs in some degree, except for those who become atheists in a very young age, before they develop the psichological dependence on this "divine entity". The story behind the expression is interesting. It started with an interview a writer (Vides Junior) had with me about five years ago for a book he was writing, yet to be published. 8 - Does the search for knowledge necessarily lead to atheism? My answer: No, but it favours it. It depends a lot on what premise the person starts from. I know people who have a lot of knowledge, but as they start from the premise that there is a god, they only take into consideration the arguments that favour this perspective. For knowledge to lead to atheism, the person has to be very honest, and he has to be able to face very hard truths, among them what I call 'cosmic solitude'. 9 - What is god? My answer: That's complicated. I think it comes in part from the need to feel protected, in part because human beings are not able to accept their own finitude. It's hard to face the cosmic solitude. According to Freud, 'god' is the father figure, and can be protective or punishing, or both. Anyway, extreme religiosity is usually a sign of immaturity, incapability for making decisions. He got curious and asked me to get deeper into the concept of "Cosmic Solitude"
My answer: Searching the internet, I found that it has to do with Carl Sagan, but it's about the fact that we don't have contact, and neither do we know if there are inhabitants on other planets. I started to use the expression to define the feeling of helplessness that follows when we stop believing in a god. I got the idea from a book of Flávio Gikovate [a Brazilian author], but I don't think he used this expression. The idea is that before the Universe we are nothing, totally insignificant. As there is no god to protect and guide (and punish) us, we are alone, helpless. We are forced to decide for ourselves, to assume total responsibility for our lives, and that's hard to do. This makes people more important, since they are our only source of support. It also forces us to accept imperfection as something inevitable, to understand that life is not fair and the world isn't good, and will never be. Later on I developed the concept a little further. The acquisition of knowledge will never be enough to make someone reconsider his concepts, especially the most cherished and deeprooted ones. You have to resort to an almost brutal honesty, you have to be able to bear the pain of realizing that we are wrong and trying to fool ourselves. Facing ourselves is the most difficult thing to do, and to admit that we are wrong causes a mental distress very hard to bear. But after the fear passes, after the feeling of helplessness is accepted as the inevitable consequence of our independence, many things change for the better. One of the feelings that arises is an amazing sensation of freedom. Since there is nobody to protect us, neither is there anyone to punish us. The responsibility that is imposed upon us during this process also implies in freeing ourselves from 'imaginary sins', there is no such thing as sinning in our thoughts, the only thing that matters are the concrete results of our actions. We are alone before the Universe, that's true, but we have each other; human solidarity assumes an entirely new meaning. The idea that we are absolutely insignificant in the great scheme of things, that the Universe wouldn't change a bit if our little planet would cease to exist, is a hard blow on our self-esteem. The paradox of our existence is this: on one hand we are nothing to the Cosmos, on the other hand we are extremely important to the people around us. Alone in the Universe, but together. In Kentucky, the 51-year-old attorney is defending Pope Benedict XVI from a deposition motion in a case involving child abuse by clergy. In a suit pending before the U.S. Supreme Court, Lena is arguing that the Vatican cannot be tried for transferring a predatory priest from Ireland to Oregon. In Mississippi, he is defending the Vatican against accusations that it participated in a money-laundering scheme. In New York, Lena is defending the Holy See in a commercial-licensing dispute about the use of images belonging to the Vatican Museums. Wherever it is in the United States that the Vatican stands accused, Lena is there to protect it. “I am counsel for the Holy See,” Lena said. Is atheism just a negative? To begin with, for the sake of keeping things simple, atheism is in fact just the non-belief in deities. But does it really end up being "just" that? I think atheism is a moment of transformation, it's a radical change in focus. It's like when you stop running after the mirage far away in the desert (the one that when you get close you realize there's nothing there) and start paying attention to what's immediately around you, having a good chance to find something that could really give you a means of survival. The moment we stop believing in any deity, most people also stop believing in any supernatural fenomenon, soul and afterlife. When we drop these concepts, the focus of our lives end up changing radically. Since we're not going to have a "second chance with the people we love, all that's left is to pay attention to them now, be with them and treat them well while they are here with us. Since there are no supernatural fenomena, there's no point in waiting for a "divine intervention", we have to act and make decisions on our own. Since there's no "soul", the idea of "sin" also loses its meaning, and what matters are the concrete consequences of our acts. We start to understand that we have to act here and now, and that knowledge is fundamental for us to be able to act more effectively. Studying and learning more about the world around us becomes more and more important, and we also want to share our knowledge with other people. We analyse the evidence and draw conclusions instead of believing. We start giving more importance to compassion and empathy towards all others, instead of worrying about some rules written in a book. I have already said this in other occasions, and I will say it again: atheism is not something we decide to adopt, it's a conclusion that we draw after analysing the facts and comparing to what we have been told. Nobody convinces anybody to become an atheist, it's an inner, private process of each person. It might seem something simple and small but, as I tried to show above, it has dramatic consequences on the way we look at our lives. I was born in Finland, but I have lived in Brazil for the last 40 years. I teach English and Swedish and I love to read about everything. It ranges from Harry Potter and The Lord of the Rings to Carl Sagan, Richard Dawkins and Stephen Pinker.